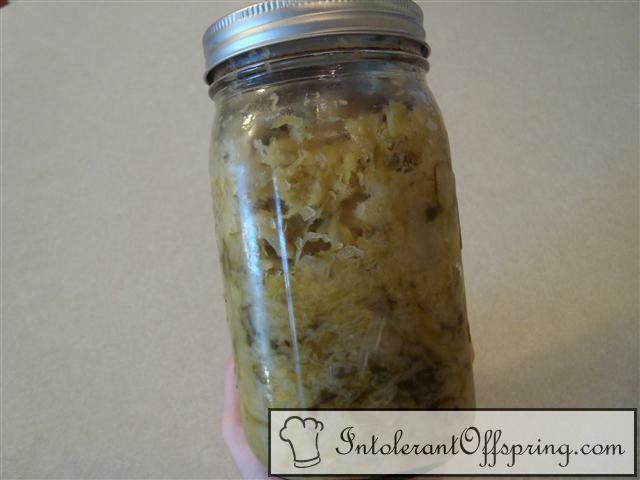 Using a food processor or knife, shred cabbage finely. Place cabbage in a bowl and sprinkle salt over it. Let sit for 20-30 minutes. Using your hands, mix cabbage and squeeze/knead until lots of water is coming out of the cabbage. Continue doing this for 5 minutes or so until you have lots of extra water. Spoon cabbage into one or more quart size jars and pack tightly, leaving about 2" of head room at the top. Pour cabbage water into the jar, leaving about 1" head room. (If you don't draw out enough water from the cabbage, pour filtered water into jar.) Screw lid on and place in a bowl in a dark, cool place. In the beginning, you will have to unscrew jar every twelve hours or so as the good bacteria grows. Unscrew lid and use a spoon to press cabbage down below the brine. After a few days, you will only have to do this process about once a day and then eventually just every few days. Allow to ferment for at least 2 weeks, but as long as you'd like to your taste preferences. Once you like the taste, put in the fridge for eating.